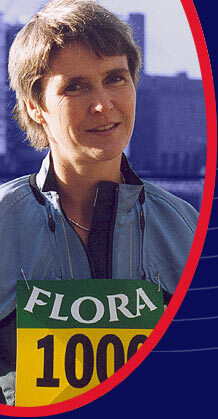 Stamina star Sharon Gayter revealed today that she felt "really, really good" as she entered the second week of the Flora 1000 miles challenge. The Guisborough ultra-athlete is one of six athletes running one mile an hour over 1000 hours in an extreme test of mental and physical endurance around the streets of London. 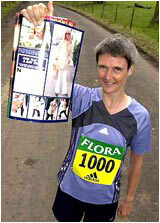 Sharon and her fellow runners still have more than 800 miles to go, but stressed she was coping well so far. She said: "I am still sleeping well and am finding the routine of getting up, doing two miles and going back to bed no problem." One difficulty has been finding the right food to eat due to limited kitchen facilities on the tour bus. She said: "The takeaway food continues to be a problem. That is, before the discovery of a Marks and Spencers on route. "It is stocked with much more nutritious ready meals that can be heated in the microwave." When Sharon reached the 100 miles mark, on her 11th wedding anniversary, a cake was made for her and presented by husband Bill, who is with her for the entire six weeks.